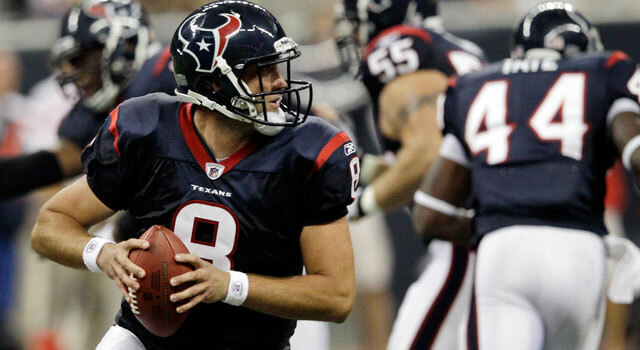 Published: Aug. 21, 2011 at 03:28 p.m.
Matt Schaub and the Houston Texans' offense are already on a roll like it's October. Granted, it is still tough to make strong assessments based on a little more than a quarter of play, but we can still pick up valuable insight from watching players perform in a structured environment. » Alex Smith is still maddeningly inconsistent. The presumed starting quarterback of the San Francisco 49ers shows flashes of brilliance as a passer, but those moments are often undone by inexplicable turnovers that leave you scratching your head. Smith led the offense on two long drives against the Raiders by efficiently getting the ball to his playmakers on quick-rhythm throws. His accuracy was superb. In fact, he delivered a 32-yard bullet to Josh Morgan that showcased his courage, toughness and anticipation in the pocket. On the other hand, Smith tossed a bonehead interception to Matt Shaughnessy on a misread of a zone blitz. Granted, the pre-snap disguise of zone pressures can fool even savvy signal callers, but the failure to diagnose the basic zone blitz used by the Raiders is surprising for a seven-year veteran with a ton of experience. Jim Harbaugh was willing to gamble on his ability to rebuild Smith into a capable playmaker, but early indications suggest his quarterback remains an enigma. » Gary Kubiak has the Houston Texans' offense in midseason form. The savvy offensive architect called a flawless first half against the New Orleans Saints that showcased balance, explosiveness and versatility. The Texans scored on their first four possessions and missed a chip-shot field goal attempt at the end of their fifth drive. Matt Schaub was outstanding operating from the pocket. His timing, execution and ball placement was superb against the Saints' zone coverage. He tested the weak points of coverages by connecting to seven different receivers on a variety of horizontal and vertical throws. Schaub also worked efficiently off bootleg and play-action fakes, and he routinely delivered the ball in rhythm to his playmakers. The Texans' success through the air was complemented by a physical ground attack that featured Arian Foster and Ben Tate running roughshod through the middle of the Saints' defense. The duo combined for 142 rushing yards on just 14 attempts. Although Foster's success isn't a surprise considering he led the league in rushing a season ago, Tate's effectiveness was shocking to say the least. The second-year back repeatedly found open creases between the tackles, including a 43-yard jaunt on a delayed draw. With Tate suddenly emerging as a viable option in the running game, the Texans have a two-headed monster that threatens to pose serious problems for opponents. The Texans have fielded one of the league's most explosive offenses the past few years. Kubiak just might make them even more dangerous this season. » The Seahawks' offense is stuck in neutral behind a struggling offensive line. Seattle's first-team offense struggled moving the ball for the second week in a row, largely because of the ineptitude of its frontline. Yes, the Seahawks are without left tackle Russell Okung, but the failure to create a push at the point of attack is a significant problem. The Seahawks' top runners -- Marshawn Lynch and Justin Forsett -- amassed only 10 yards on 10 attempts. The running game was so bad that it failed to score on four consecutive runs from inside the 2-yard line against the Vikings' second-team defense. The offensive line's inability work in concert in pass protection remains a problem as well. The unit has been overwhelmed physically and tactically by opponents, and its inability to protect Tarvaris Jackson in the pocket has resulted in little production in the passing game. While Jackson can shoulder some of blame for a few errant tosses, he has been harassed and forced to flee the pocket, which has killed any and all rhythm. Seahawks coach Pete Carroll wanted to get his team off to fast start by leaning on an offense with several explosive weapons, but his leaky offensive line is preventing the unit from gaining any traction during the preseason. » The Titans have discovered a gem in Jamie Harper. The extended holdout of Chris Johnson has enabled the team to uncover another potential playmaker in Harper, a fourth-round pick. He has been outstanding throughout training camp and flashes the skills to be an effective complement to CJ2K. At 5-foot-10 and 233 pounds, Harper is a rugged runner with the strength and power to grind out tough yards between the tackles. Yet, he also shows the vision, quickness and cut-back skills to slip through creases on the backside of plays. He showed just what he is capable of on his 46-yard burst against the Rams. Although he lacked the speed to take it the distance, his ability to break off big runs at his size gives the Titans a formidable weapon to spell Johnson.